"The Imitation Game", penned by Graham Moore, was a part of Hollywood's infamous Black List, an annual tabulating of the industry's most notorious unproduced screenplays, and it's just this sort of screenplay that calls into question the Black List's whole vetting process. It is based on Andrew Hodges book titled, expositorily, "Alan Turing: An Enigma", the English mathematician who helped break the Nazis' unbreakable Enigma code in the midst of WWII. As such, Morten Tyldum's filmed version of this biography theoretically seeks to solve the enigma of Turing himself only to essentially water down all the real man's complexities that genuinely made him an enigma. It's an indefatigably paint-by-numbers biopic packed with ceaseless components of scene construction ripped straight from a Robert McKee screenwriting class. If the main character is threatened with being fired, rest assured, his colleagues will threaten to quit, as if Alan Turing momentarily becomes Rudy Ruettiger. If the code is to be broken, and duh, it is, rest assured, it will happen in the immediate aftermath of an "A Ha!" Moment when a female character played by a deserves-so-much-better-than-this Tuppance Middleton is brought in for a single scene solely to expectedly deliver the "unexpected" turning point. Artists can master form, as Mr. McKee likes to harangue, but if the form the artist is mastering is assembly line banality then all you're left with is movie-going bread and water. 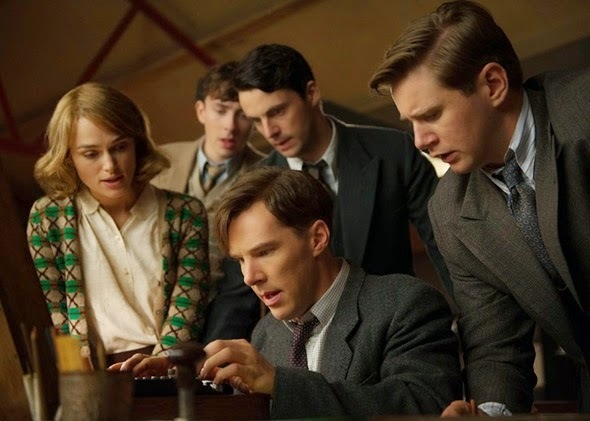 Actors have long been tasked with adding flavor to these sorts of milquetoast productions and "The Imitation Game" is no different as Benedict Cumberbatch - playing Turing - and Keira Knightley - as his primary code-breaking ally Joan Clarke - recently reaped SAG nominations for their exemplary professional performances of fine technical merit because I suspect their fellow industry men and women saw this movie and thought to themselves, "Christ, I've been stuck in a blasé biopic too. I know how hard that it is." Thus, despite the role's psychological limitations, Cumberbatch throws himself into it with physical abandon, convincingly affecting the speech and gait and attitude of a man whose social skills are, at best, insanely awkward, though he is discernibly brilliant in spite of himself. And though Knightley is primarily called upon to react to his alternate foundering and intellect, she manages to credibly carve out a markedly intelligent woman in a male-dominated society. The film is told in flashback, beginning in 1951 in advance of Turing being charged with gross indecency for homosexual acts and being prescribed hormone pills to secrete the gay out of him because, you know, science and all. This is crucial because it makes Turing’s homosexuality the framing device and if it's the framing device then it is made to hover over the entire film. Yet it is only touched upon, never explored. To cover he proposes to Joan and she accepts, yet their relationship in the movie often feels as counterfeit as their sham engagement. "I had my suspicions," she says when he tells her the truth but……when did she? Why did she? The movie never says. The movie never shows. The movie barely has the bare minimum of psychological insight. His sexual proclivity is simply a badge. This is a Weinstein Company production and we all know how those Weinsteins like their awards and awards often don't reward risks and so the film pitches it right down the middle. Yet if you look carefully, all throughout, lurking around the edges, occasionally peering through the fogged up windows, is another movie, a more emboldened one seeking to be less a story of codebreaking than a character study of the closeted gay man breaking that code. Instead we're left with a striking cutout in a tweed coat, and what could have been insightful and cutting winds up eliciting the an atmospheric aura comparable to Joan Clarke's cache of warm, familiar and very, very reserved cardigans. YES. There most certainly is another, better, more character-focused film lurking within. This film was about what I expected it to be, but I really felt that it could've been much more. I'm only here to talk about Keira Knightley, who probably wins my award for best entrance and does (as is her wont) injects the film with a significant amount of panache. The film's hesitancy re Alan's homosexuality is frustrating, even as I understand they mean for us to be kept in the dark and the film is to function as a literal enigma shrouding the fact. It doesn't quite pay-off, but re your question of when does Joan have her suspicions it's an impossibly fleeting moment when Alan refers to his machine by its name (Christopher) and Joan says, "You named him?" It's not a deft moment from the script but it's the quintessential example of Keira adding depth to the role which on paper is not much but actually becomes my favourite of the film.